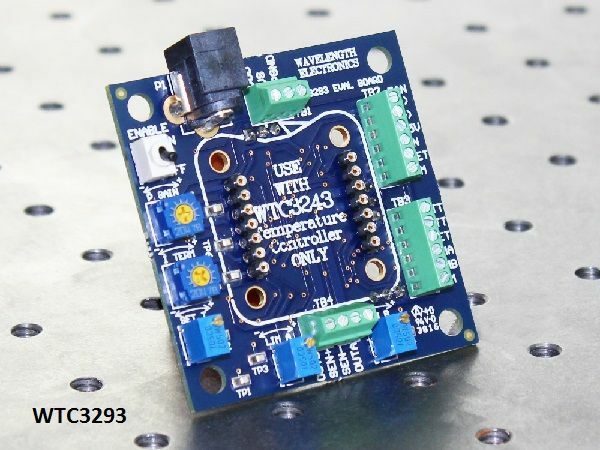 The compact WTC3243 temperature controller module achieves 0.0009°C temperature stability and provides drive of ±2.2A of TEC or RH current. Small size: 1.3" x 1.28" x 0.313"
The compact design of the WTC3243 Temperature Controller achieves 0.0009°C temperature stability. Its award winning package can be integrated with a heatsink WHS302, thermal washer WTW002, and fans WXC303 (+5 V) or WXC304 (+12 V) for easy prototyping. The linear, PI control loop offers maximum stability while the bipolar current source has been designed for higher efficiency. The WTC3243 drives up to 2.2 A for either Thermoelectrics (bipolar) or Resistive Heaters (unipolar). An evaluation board simplifies prototyping: WTC3293. A model compatible with Li-ion batteries is available: WTC3243HB. The WTC3243 temperature controller is easily configured for any design. A circuit calculator tool speeds selection of external component values (see Design Tools tab). Virtually any type of temperature sensor can be used with it and a built in sensor bias current source simplifies use with resistive temperature sensors. The Proportional Gain (P) and Integrator Time Constant (I) are set by external resistors and can be modified to optimize temperature overshoot and stability. Other features offer added flexibility. Independent heat and cool current limits are set by single resistors. An onboard reference voltage simplifies potentiometer control of the temperature setpoint. You can also choose to operate remotely with an external setpoint voltage. Monitor actual sensor voltage at pin 9. 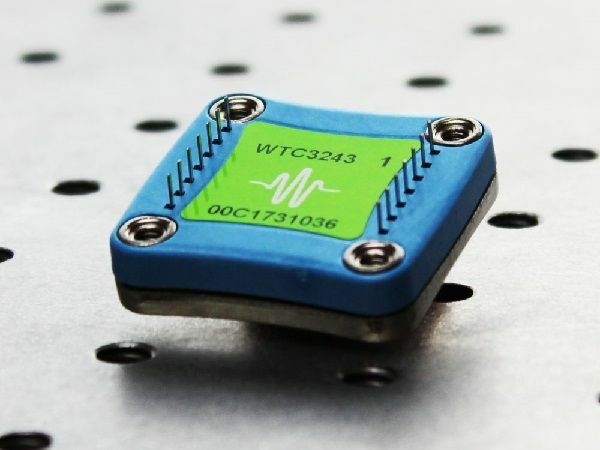 The robust and reliable WTC3243 is designed into electro-optical systems, airborne instrumentation, Raman spectrometers, and medical diagnostic equipment. The WTC is particularly suited to applications where temperature is scanned across ambient. Wavelength provides the free LabVIEW Virtual Instrument executable file for use with the WTC3293 Evaluation Board. The executable VI also requires the LabVIEW Run-Time Engine, available for free download from the National Instruments website, as well as the DAQmx Viewer also available for free from the NI website. The source code for the LabVIEW Virtual Instrument module is available for free in case you wish to modify the program yourself. Alternately, Wavelength can customize the Virtual Instrument to suit your application. Contact a Sales Engineer for assistance. – The WTC3243 incorporates remote voltage control and temperature monitor. The WHY5640 does not. – The WTC3243 supports AD590 and LM335. – The WHY5640 requires external circuits to operate anything other than resistive sensors. – Two or more WHY5640s can be used together for more output current. – If you do not need all the features of the WTC3243, the WHY5640 is a lower cost solution. NOTE: The WHY5640 and WTC3243 do NOT have the same pin configuration.